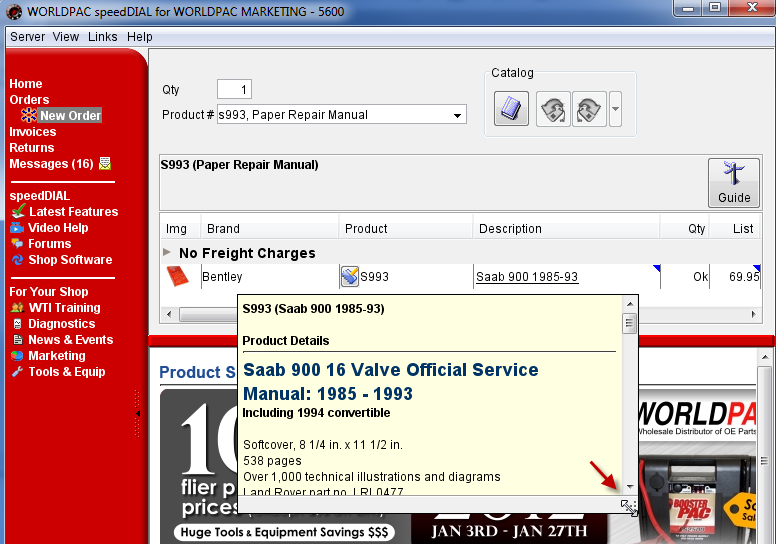 WORLDPAC added a new button in the Price and Availability section to temporarily hide and show Advance Pro catalog. speedDIAL starts with Advance Pro button defaulted as "Hiding" Advance Pro catalog. 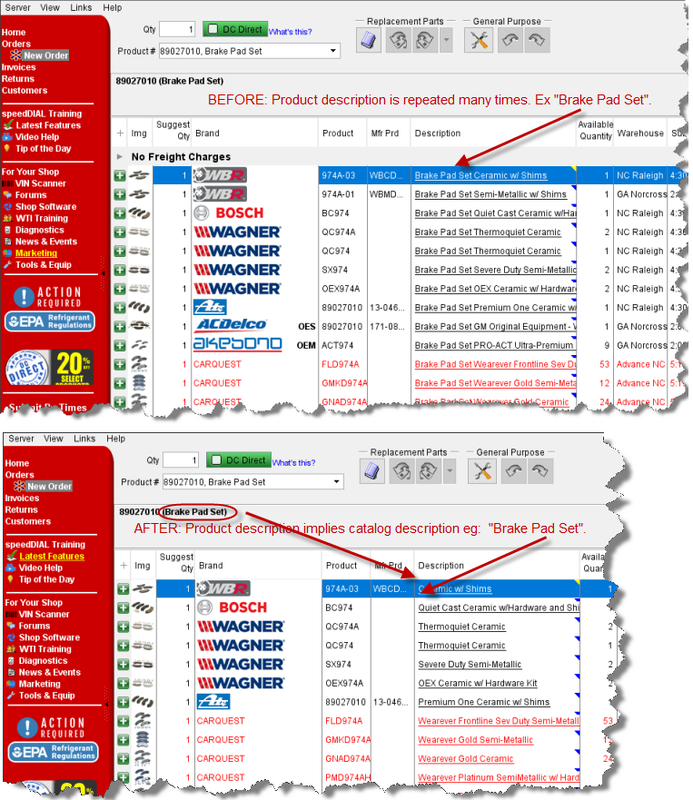 When button is set to "Hiding", Advance Pro catalog will not appear with priced products. Some exceptions apply such as if WORLDPAC has no offering, Advance products will appear. 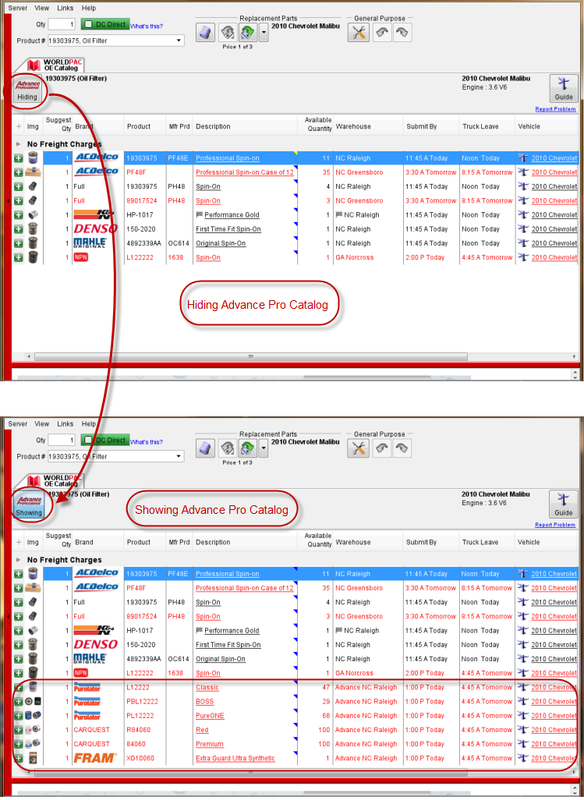 Click the button and Advance Pro catalog appears. See below, second half of image. Button state (Hiding or Showing) is saved between speedDIAL runs so there is no need to click every time speedDIAL is started. Replaced "(Any Position)" label with less confusing label. Part Type selection clearly indicates OE or manufacturers catalog. Old "Any Position" label indicates the need to see product details. The label was changed to be less confusing. 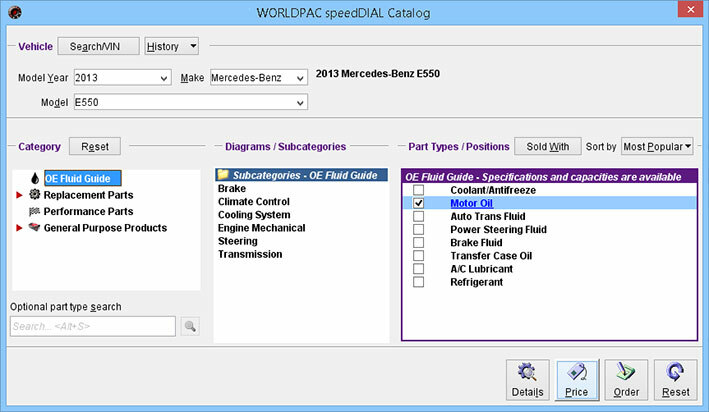 speedDIAL will show the type of catalog (WORLDPAC OE or Manufacturers) where the product is offered. "Close" button renamed to "Save". Customers asked WORLDPAC to change "Close" button to "Save". Functionally the same but less confusing. Join the speedDIAL BETA program. Visit www.worldpac.com/beta. Repeating catalog description is abbreviated reducing clutter. Estimated local delivery time shows in bubble. Trouble logging on to speedDIAL or forget your id or password? Click the link in the log on window for Customer First. WORLDPAC is rolling out improved delivery service throught the country. Submit your order for local delivery, anytime. Get your parts within 90, 60, or 30 minutes! 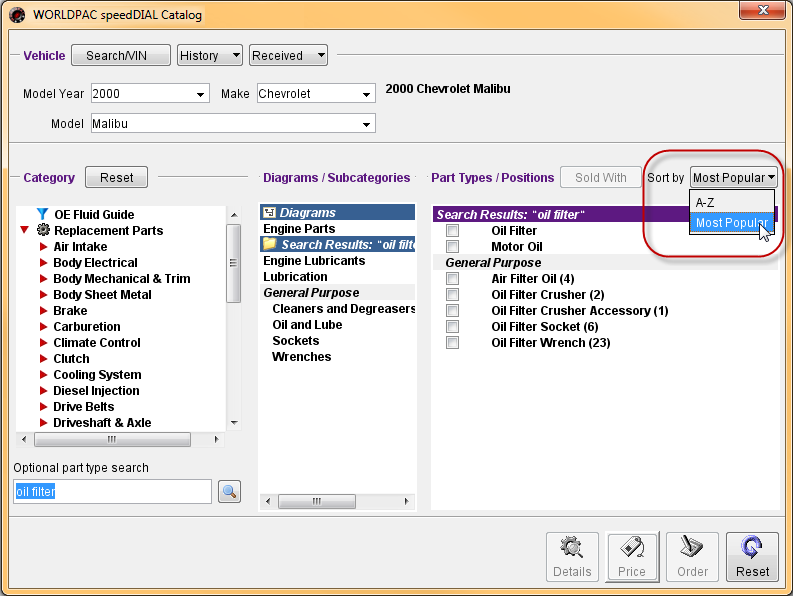 speedDIAL supports browser-based shop software. 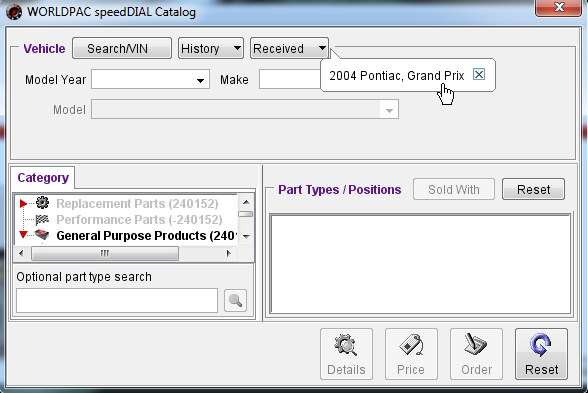 Ask your Shop Software Vendor if they have a browser-based system that integrates with speedDIAL. For a demonstration, go to WORLDPAC's Shop Management System demo. speedDIAL shows you when your order is on it's way. 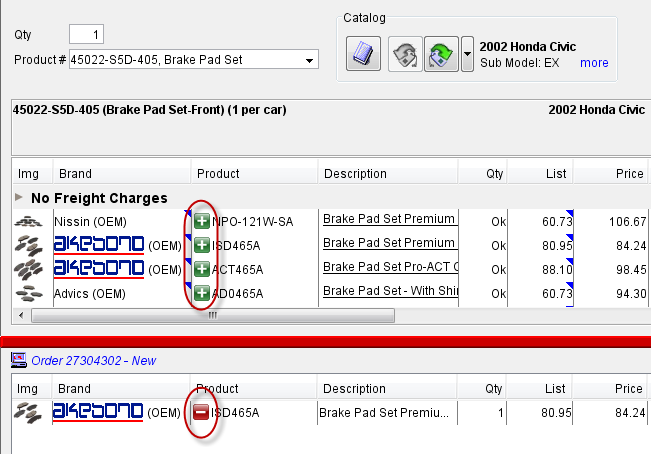 Details panel shows one tab for all Aftermarket Catalogs. The following four part types will be now be found under R2041 Blower Motor Regulator. 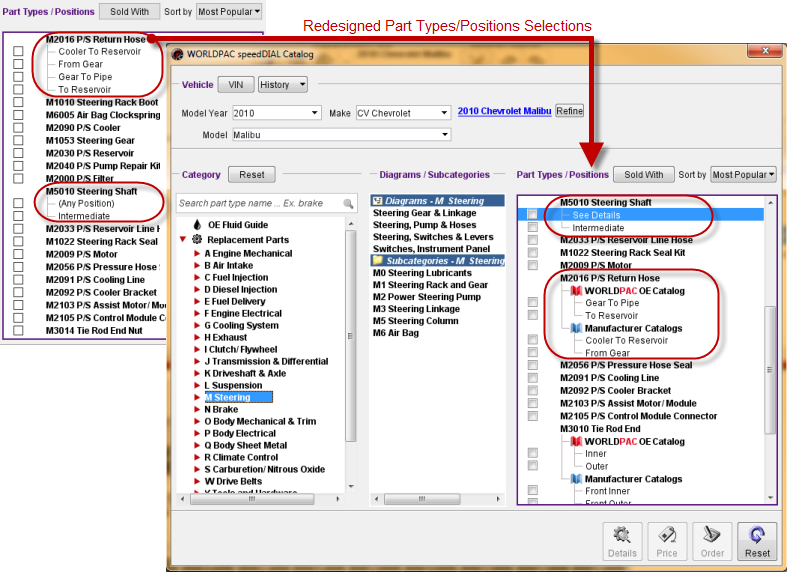 Searching the description of the removed part types will lead you to the R2041 Blower Motor Regulator..
All five part types below service the same part, yet Aftermarket Catalog Suppliers have selected different part types for different makes to deliver the data. R2005 A/C Blower Control Unit is not the switch/knob portion, applications under this part type; they are actually resistors/regulators. Solution: Similarly to what was done with Fuel Pumps, we will use one part type as the primary driver and group the other four part types under the primary part type. 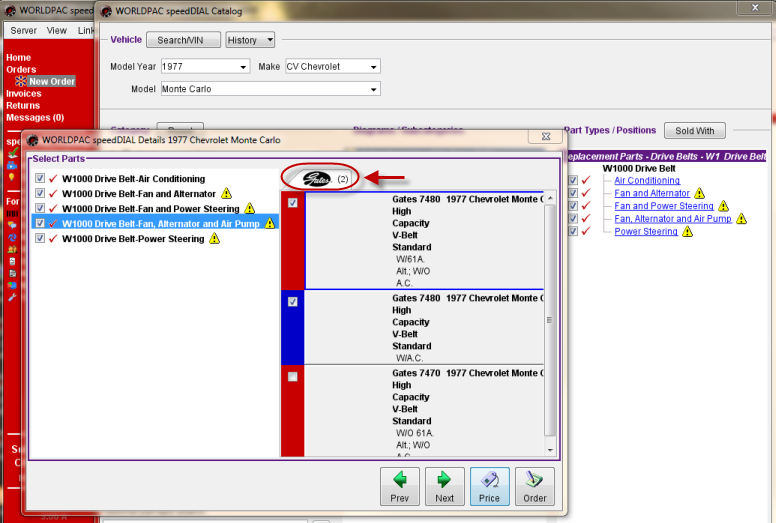 In this case, R2041 Blower Motor Regulator will be the part type that is shown in speedDIAL. Searching the description of the removed part types will lead you to the R2041 Blower Motor Regulator. WORLDPAC announces General Purpose Catalog where you can find gloves, adhesives, tools, and more. 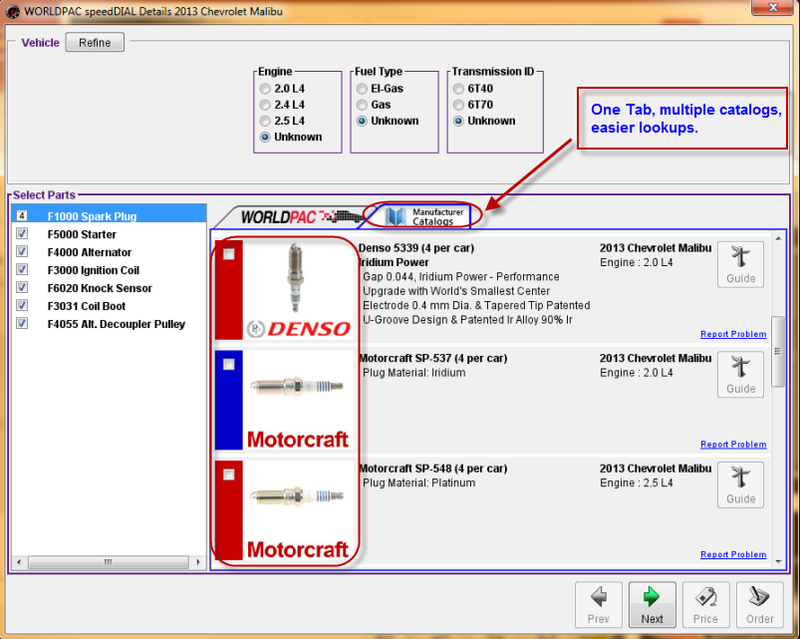 Toggle between the General Purpose catalog and Replacement Parts catalog by clicking the General Purpose button. 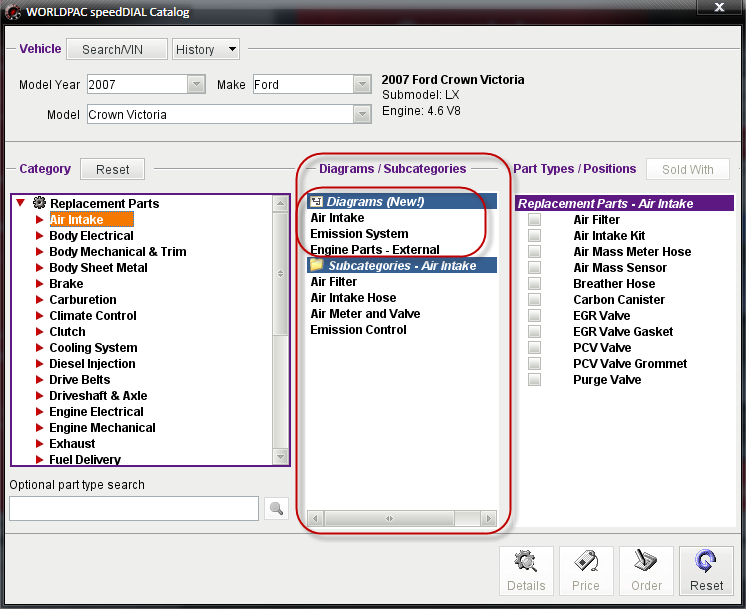 Navigate product categories and sub-categories using the drop-down menus. Use Search to find products by name, part#, brand, or by description details such as "DOT 5.1". Click the product image or name to view full product details and larger image sizes. Hover the mouse over "Ships:" info for a quick-view of availability, shipping and price information. Filter products by Category, Brand, and Series. Sort by Popularity, part#, etc. Use "breadcrumbs" to help navigate your path through the catalog. To order a product, (Step 1) change the desired quantity and (Step 2) click the “Order” button. A new order appears in the speedDIAL Navigation Bar. To view the order, (Step 3) click the order number in the Navigation Bar. Your product is on a new order where you can make changes or checkout as you normally would. 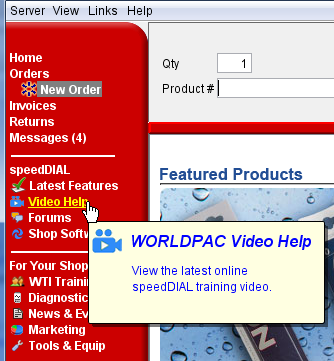 WORLDPAC’s real-time Special Order Program is available through our award-winning speedDIAL® software. Now you will have access to virtually thousands of parts that have not been available through our normal distribution network. We are expanding our inventory availability to include the entire offering of many of our leading manufacturers. This program makes it easier to buy most of your parts through speedDIAL and to better service your customers. Special Order products are shipped from our manufacturer’s distribution centers to our local warehouse and then delivered by WORLDPAC delivery vehicles. Freight charges apply to cover the shipment from our manufacturer to the WORLDPAC warehouse. The Special Order products are shown below a gray line that states: “Freight Charges May Apply – Special Orders Incur Freight Charges". The Special Order products show a special order icon in the price column as well as “Special Order – Ship-from State & City” in the Warehouse column. The Truck Leave time and date are estimated based on manufacturer inventory availability, ship-from location, shipment date, estimated shipment arrival to our warehouse, and when the next local delivery vehicle will leave after receipt. If our manufacturer fails to ship our order by the committed day and time, WORLDPAC will notify you of the delay. Previously, Special Orders from WORLDPAC U.S. to WORLDPAC Canada customers were only available as a 5 to 7 day free service from our U.S. distribution centers to our Canadian distribution centers and then on to your local branch for delivery. While this service is still available, we are now offering a NEW PRIORITY service which will allow you to order directly to your local branch from our U.S. distribution centers for next business day delivery in most cases. You will be given this option in speedDIAL when you submit your order. Please note that if you choose this option, there is an additional freight charge (see above). Please contact your account Sales Representative or our Customer First Department (1-855-878-8750) if you have any questions or require additional assistance. Better sorting of Price and Availability. Available Products will be returned to Price and Availability by the exact item/brand match, if there is stock availability. Continuing with SAME brand within service level. Sort Part Types/Positions by alpha name or most popular. Search for a specific product and speedDIAL shows your search results along with other related prodcuts. See a problem with the WORLDPAC Catalog? Report it to the WORLDPAC Catalog Team. US and Canada Support line is changed to 855-878-8750. Purolator packages can be tracked from speedDIAL. Improved logic for Mercedes Benz 7-character chassis range. Improved VIN selection of chassis range in Details panel. Orders are created using customer time zone. speedDIAL with Special Orders (Canada only). 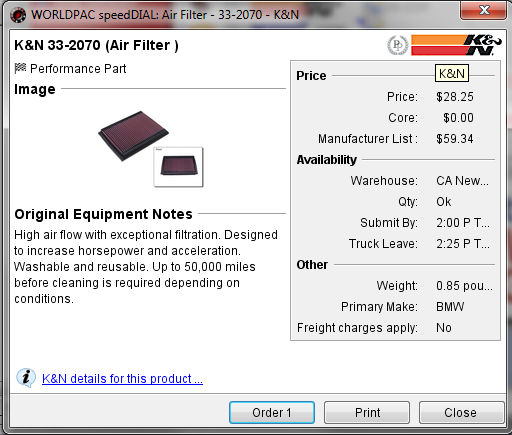 Access 1000's of SKU's from WORLDPAC's huge parts network across the US and Canada. Stock Orders in speedDIAL. Now easier than ever. Filter products by Category or Make. Buyer's Guide is improved. Click the sign-post to the left of the make name. Stock Orders are shipped from our large distribution centers. Freight cost is minimized by utilizing our internal transportation network or aggregating shipments. To keep the cost down, there is a $500 minimum order. The Checkout button becomes active once you have reached $500. Several lists of suggested Stock Order products and quantities are provided to aid in quickly building your stock order. New lists and features will be added over time. Your Purchases: Your top purchased products during the past 12 months on all orders. Popular Replacement: Top selling replacement parts in your region, for your top vehicle makes. Popular General: Top selling general purpose products, not tied to specific vehicles. Product # entry and the parts catalog will continue to work as normal for stock orders. 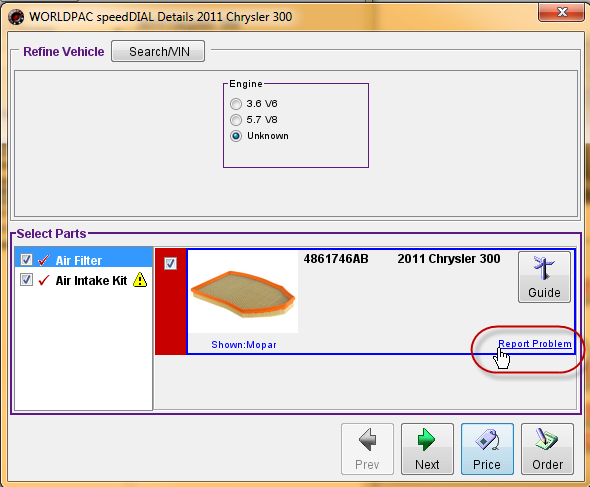 Includes an optional filter for both product category and vehicle make to help you zero in on specific areas of interest. 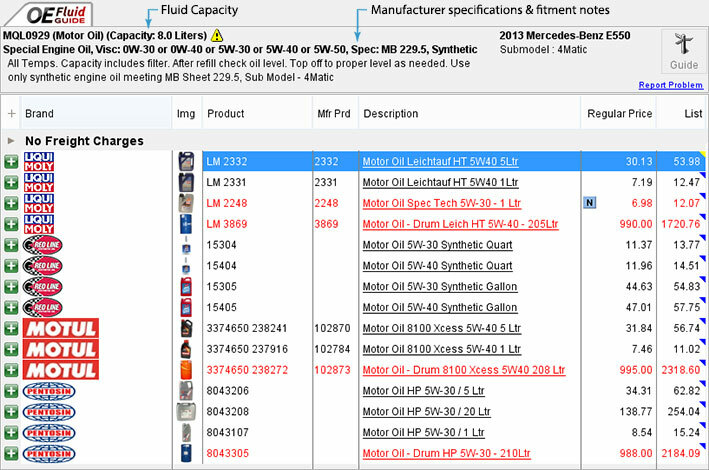 Manufacturer's product code column helps identify products you may already have in inventory. Both your Regular Price and your Stock Price are shown side by side. The Stock Order price is always lower! 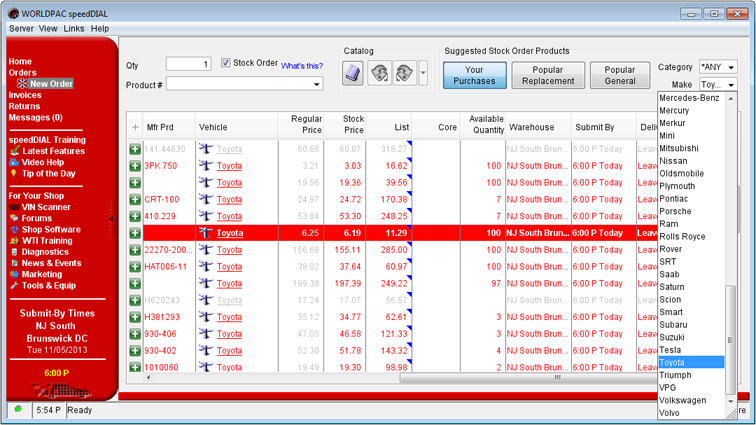 Buyers Guide button for each product row showing all vehicle makes, models, and year range. For the "Your Purchases" list, the "Average Monthly Quantity" shows your average monthly purchases from WORLDPAC. For the "Popular Replacement" and "Popular General" lists, the "Average Monthly Quantity" is calculated from customers like you. 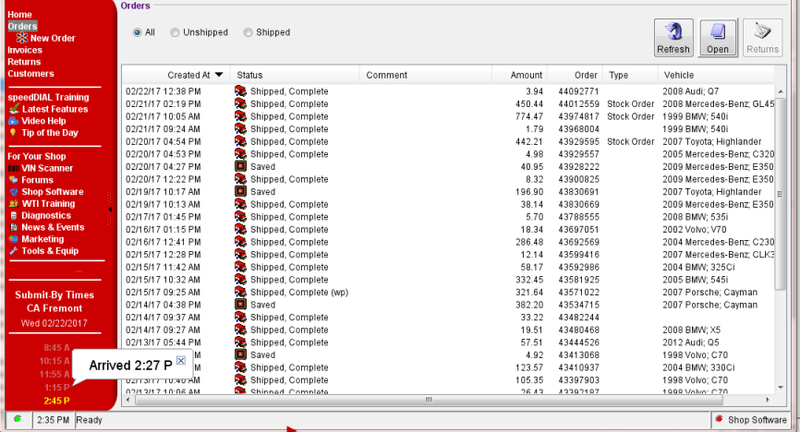 "Last 30 Days Quantity" is your purchased quantity on stock orders during the past 30 days. Introducing speedDIAL Tip of the Day. Made speedDIAL 100% Windows 8 friendly. Download the WORLDPAC mobile VIN scan application to your mobile phone. The DELETE key in speedDIAL messages works. speedDIAL Terms and Conditions are updated. The Order Entry tooltips have been moved above the buttons. It's easier to see the text of the buttons. New icons make ordering products more intuitive. You have the ability to size the description flyover window. Use F2 key to set keyboard focus. Use your mouse to grab and resize the flyover from the lower right corner. .. Or you can turn off the flyover completely using preferences. Fixed a problem where speedDIAL would show an error message upon closing. Resolved the problem of speedDIAL opening the Catalog in a very small window. Significantly improved email sent from speedDIAL. Many times, customers might need to know their ISP server settings to allow speedDIAL to properly send email the their Sales Representative. With this release, speedDIAL will sucsessfully send email 99.9% of the time. Improved time shown for truck leave for customer in the Pacific timezone. We fixed the "blank screen" problem when pricing! Restart speedDIAL to get the fix. We made it easier to delete massive amounts of email from speedDIAL. Also, we changed the way invalid email is handled. Don't forget to check your Forums account settings to turn off notices. This will decrease the amount of email sent to your speedDIAL account. Added better description text to Report a Problem. Improved overall stability of speedDIAL through programming efficiencies. Added End User Agreement to log on panel. Fixed incorrect order number warning after submitting an order. Fixed Report a Problem from popping up after opening Catalog. 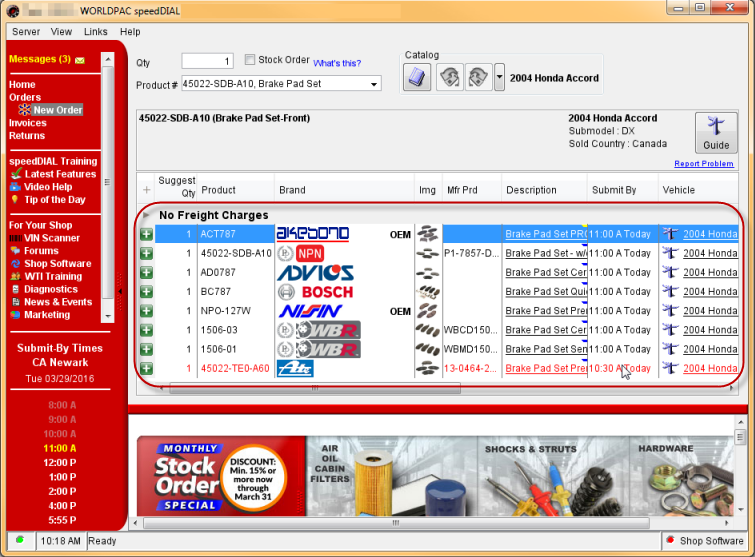 Splitter bar on Pricing and Order screen no long "jumps" blocking view of brands and prices. speedDIAL Change Log is now "Latest Features". Improved VIN lookup to prevent pumping piston. Improved Mac OSX look and feel by improving tables and layout. Show truck leave and delivery times after an order is submitted. We fixed the problem where the speedDIAL Catalog shows in a small box when using a Shop Management System. Improved reliability of thumbnail and large sized images. Improved Submit-by times shown in the red navigation bar on the lower-left side of speedDIAL. We removed the big from our Price and Availability screen and linkified all product descriptions. Fly-over with your mouse to see additional information. Now, click the link and behold a new and expanded Product Information panel. Printing problems such as over-print and program bombing are fixed. Windows Vista users should see an improvement. iMac display and layout problems such as Part Type indentation is fixed. Fixed a problem for Verizon customers. Sending email with valid Verizon credentials now works. speedDIAL time works correctly after time change and locked Windows screen. Look for your warehouse Submit-by time in speedDIAL's Navigation bar. Fixed print problem in Returns feature where wrong row is printed. Fixed VIN decoding problem where previous VIN search displays on subsequent search. Fixed a problem for R. O. Writer software where the degree symbol was not displaying correctly. Some customers were seeing flashing "runaway speedDIAL". The problem is zapped. Add menu item "Report Problem". It's easier to send log files to WORLDPAC 2nd-level tech support. First row of Pricing and Availability table will be highlighted when ever it's populated. Preferences dialog will revert changes if closed by the "X". Improved splitter bar behavior. The splitter bar is the red bar between Pricing/Availability and Order. Part Type list in the Catalog will show complete descriptive text. We widened it to accommodate new part types. Vehicle Search panel layout is improved. Use F2 in the Catalog to see the new layout. Streamlined the order checkout in speedDIAL by combining the Shipping and Submit button. The improved dialog shows what you're paying for freight (if applicable) and choices to reduce your costs. More details here. The Price and Availability panel presents products divided by applicability of freight charges. All Tools and Equipment will show "Call Sales". Less confusion about availability will result. Your WORLDPAC customer number will show in the title bar of speedDIAL. Added OK, Cancel, Default Settings buttons to speedDIAL Preferences. Now it's easy to reset the giant makes list back to the original settings. The debut of this change log. We'll update this page with significant changes you'll want to know about as they're being made. Big merge of speedDIAL code brings months of work together into the main line of the repository. User Interface enhancements include surfacing SMTP change from December 3, 2009 release into speedDIAL Preferences. For those who keep an eye on the log files, we're migrating to log4j open source logging. Major change to the underlying library system in speedDIAL. No visible changes planned. We're laying the groundwork for some awesome enhancements! 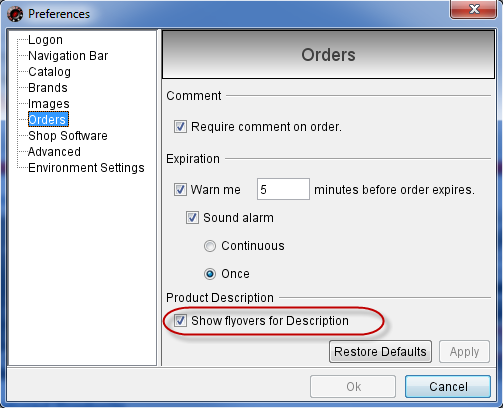 Eliminated dialog "No data on file for this request" when using the keyboard to replace product on an order. Password changes will enforce minimum 6 alpha-numeric, at least 1 number/letter and no special characters. Change "New - No Longer Needed" to "New - Not Needed"
Change "New - Wrong Part Received" to "New - Other Problem"
Change "New - Fit or Function Problem" to "New - Manufactured Incorrectly"
speedDIAL can accept custom ISP settings for sending email. This enhancement is required because Verizon and certain ISP's require authentication to send email. With this change, there is no User Interface access to these settings. You must call WORLDPAC Help Desk if you need assistance or refer to our web page for help. WORLDPAC announces Fantastic Voyage III - The Central American Adventure. Sails in 2011. Now you can use the RIGHT ARROW key to open the Details Panel to show refinements. speedDIAL will now run on Mac OSX 10.4+. Download the beta version here. Add Tools link to Navigation Bar. Old JVM 1.3 speedDIAL customer are getting notification they need to re-install speedDIAL from the web before August 27, 2009. Fixed problem with drop-ship dialog not disappearing under certain conditions. Changed the way email is handled. Customer is less likely to lose email after this fix. Improved the expand/collapse behavior of the Category tree. Improved fly-over's in Navigation Bar. Chassis selection wrong for VIN. Fixed. Freight charges appearing through speedDIAL are highlighted. Moved Professional Resource items to Navigation Bar. Google Maps for Will Call items is fixed, finally!. Details Panel will honor quantity-per-car from our database but allow the customer to override it with their own number. Overnight customers will notice new colors on priced and ordered products. Priced Products that leave TODAY will be shown in black. Products leaving any day AFTER TODAY will be shown in RED. For products on an order, Products which arrive next business day AFTER order creation will be shown in black. Otherwise Ordered Products will be shown in red. speedDIAL internationalization is complete with the implementation of Spanish and French translations. WORLDPAC eServices is encouraging our customers using an old version of Java (JVM 1.3) to upgrade to a newer version (JVM 1.5). You can download an upgraded version at www.worldpac.com. Updated the Sales Contact dialog to make it easier to use. Click on Help | Sales Contact to see the change. Part Type notes flyouts will accommodate very long notes. An example is 2005 Hyundai Accent, ACC Cabin Filter. 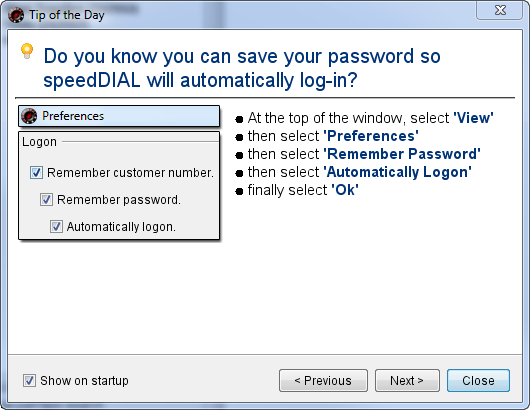 Simplified Logon dialog or when logging on again. Add instruction to RMA creation. Please be sure to write the RMA number on all shipping boxes. Price and Availability panel to use application level notes, if available. Fixed a problem in speedDIAL where delivery warehouse shown is not the actual warehouse delivered from. WORLDPAC kick's off the Expo 2009 Promotion. Improve Refine Vehicles in Details Panel resulting in choices relevant to Model/Sub-model. Results in fewer problem product choices. Customer will see a warning dialog when 0-Qty items are ordered. The dialog informs them the the product they ordered will not be delivered. Alternate (ie Non-default) warehouses show in RED in speedDIAL Price and Availability and Order Entry. Daylight saving time and speedDIAL are now compatible. speedDIAL will display in Microsoft Vista Aero correctly. 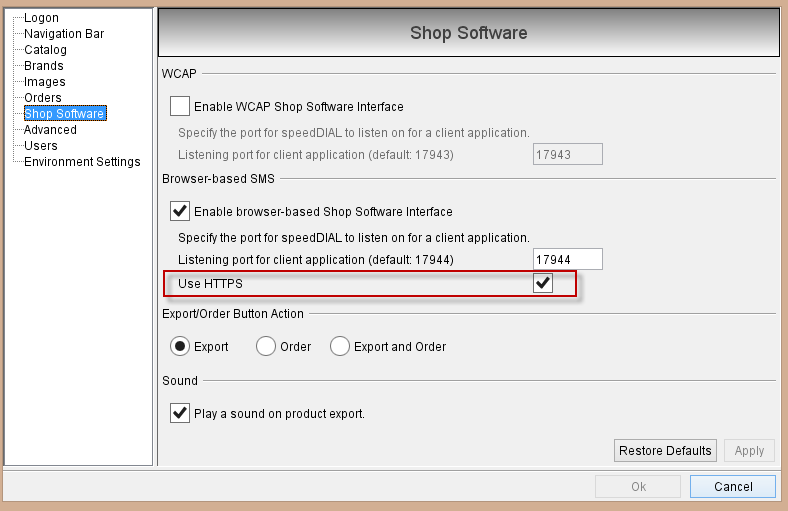 Add native ACES standards to speedDIAL Shop Management System support. Kick off the 2009 Mexican Riviera Cruise. Added "*ANY" to Categories choice in Brand Preferences panel. Buyer's guide will save last window position and column order. Added Professional Resources section to main speedDIAL window. Price and Availability drop-down turbo-charges navigation. You can navigate to previous and next Catalog price. A drop-down list shows you what you've priced and what's on queue. Quantity per car (QPC) is enforced in the following categories. Categories not listed here will be shown with quantity per car equal to "1"
VIN search is improved to use the last 7 digits to select an answer to any dynamic chassis range question that is presented. speedDIAL overall appearance is smoothed and improved. Text appears without the jaggies. 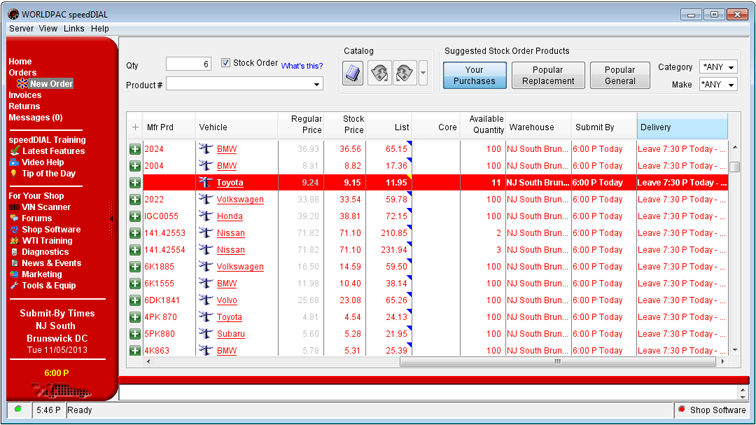 Grouping of models in Vehicle Search window enhances readability. Keyboard enhancement in Change Quantity panel allows you to use the up/down arrows to change quantity. Another keyboard enhancement is added when the "Delete Order" window is presented. Use the keyboard to navigate to your choice and press the "Enter" key to select. The speedDIAL installer includes a default list of excluded vehicles. The Catalog vehicle drop-down doesn't show obscure, prehistoric vehicle names. Improved keyboard behavior in Details panel when navigating refinement filters. speedDIAL now has the ability to integrate with many Shop Management Systems. Cut, Copy and Paste menu is available on EVERY text field. Move the mouse into any text field, click the right mouse button. Added quantity-per-car to tool tip fly-over in Part Type List. Fixed keyboard handling problem pertaining to Details/Refinements Panel. speedDIAL is made compatible with older Java Virtual Machines. WORLDPAC rolls out speedDIAL with the Next Generation Catalog. Announced the upcoming release of the Next Generation of speedDIAL. This new version has been enhanced with thousands of new catalog applications and new innovative features that improve accuracy and reduce search time. Bug fixes and model table updates. More information in the Submit By column when a part is not available. On Order - Ordered from our source. Due date appears whenever possible. Under Development - Part of our accelerated research effort. Not Stocked - Not stocked and not available in any WORLDPAC location. If you attempt to add a part to a shipped order, you will be prompted to automatically create a new order. Spanish or French will appear, if your computer is set to one of those languages. Part descriptions and notes are still in English, and will be translated at a future date. More consistent product flyover notes, and new notes to clarify list prices. The Amount column in the Invoice list now includes freight or other charges, if any. If your driver is using WORLDPAC's digital delivery system, you can review delivery/pickup records and your signatures using the Delivery/Pickup buttons and popup menu options on invoices, order lines, and authorized returns. The digital delivery handheld signature capture system continues to be rolled out in 2005 and 2006. Self-service returns are now part of speedDIAL. Search for products eligible for return, create returns, and track the status of previously authorized returns. For more information, see our Tutorial (requires Flash). In Messages, your Sent email is now saved and accessible. Clicking Will Call displays a map to the WORLDPAC location. Numerous bug fixes and code optimizations for speed and stability. 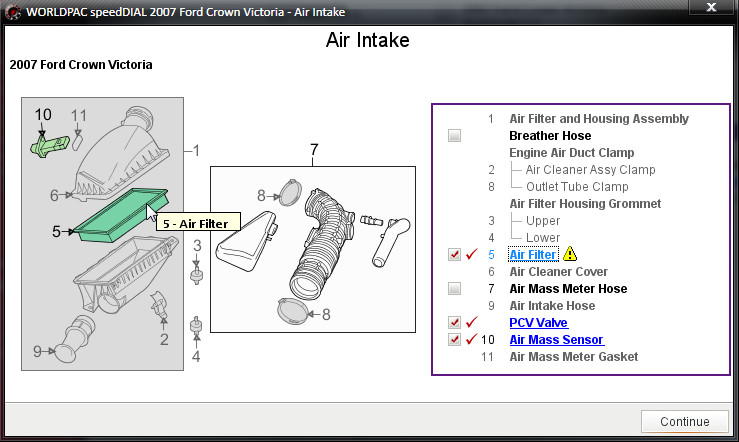 You may enter a partial part number to see a list of parts that begin with the text you supply. In addition to OEM numbers, we also reference manufacturer and 3rd-party numbers. You need to enter at least 4 letters/digits to activate the search. Preferences moved from the Navigation Bar to the View menu. speedDIAL has long allowed you to set a single default make. Now, in addition, you can completely tailor your make list. See View->Preferences->Catalog. Audio/visual confirmation of export to Shop Software. Several bugs relates to Shop Software integration were fixed. The pesky down-arrow in the parts list now actually works. The catalog draws itself faster and is more responsive. Keyboard use of the catalog and price/order panel fixed/restored. 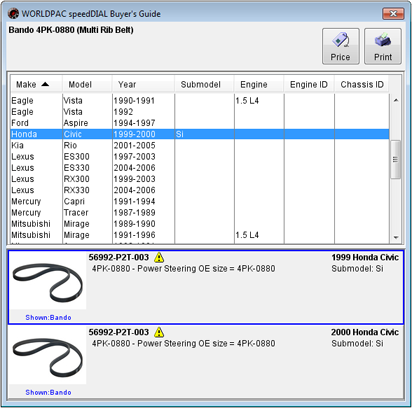 When using speedDIAL with your Shop Software, you can elect to order parts from WORLDPAC at the same time you export them. This is handy if you don't usually need quotes for estimates, and only want to share the final details with your system. See Preferences->Shop Software. Often sold with: now displays more strongly related parts. In the Parts list, click + next to any part, then quickly check off the other parts most often sold with it. Three bug-fix releases have been issued in recent weeks, making speedDIAL faster and more stable than ever. That jingling sound means you've got new messages. In our expanded catalog, browse Performance Parts for your selected vehicle, pick up General Purpose products any time, or stick with the tried and true in All Parts. With General Motors, the reorganization of domestic makes is complete. In the catalog parts list, a small + sign now appears next to each part. Clicking it displays in italics a list of parts often sold with the part in question. These entries act just like normal parts -- you can check them off and order them, go to the wizard if necessary, etc. "New Features" feature. You're soaking in it. We'll offer to show you this page each time we add features to speedDIAL. Features from previous updates are also visible. Shipping optimization, visibility and control for customers who use outside carriers. Click the shipping button. Link back to brand price list from Buyer's guide. This is handy because it lets you see the application-specific notes for each application of a part. 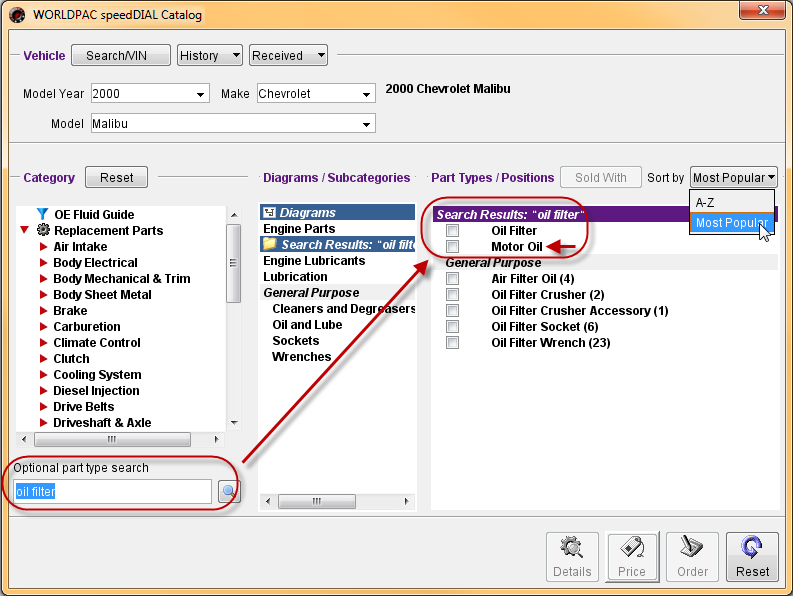 The button next to the Optional Part Search has been changed to perform the search. This is what people thought it did anyway (it actually used to clear the search). Change font in messages area by right clicking message pane. 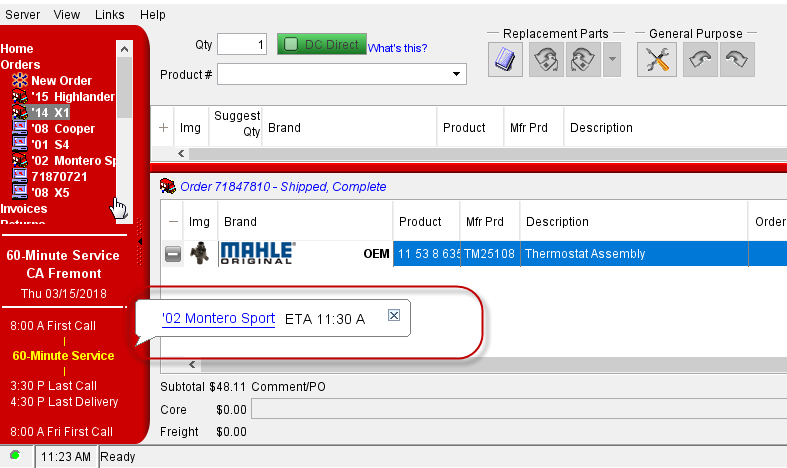 Allow multiple items to be selected and opened on Orders and Invoices lists. Added "open" button on Orders and Invoices lists. You can also still double-click, press enter, or drag to navbar. Eliminated the annoying "No Invoices Found" message when switching to the Invoice panel the first time. Community Forums. A new link to the forums has been added in the status bar along the lower edge of the main speedDIAL window. The link in the View menu now works also. Select multiple categories by control-clicking in the category list. Options to sound an audible warning when an order cutoff warning is displayed and depending upon your preferences, you can choose to make it beep once, or keep it beeping until you dismiss the dialog. These options are turned ON by default. To turn them off, choose Preferences->Orders on the Navigation bar. Submitted orders now remain on the Navigation bar after being submitted. Advanced search criteria were added to the Invoices page. You can now search by part #, order, invoice, type, and more. A date range is always required. In the catalog, only makes applicable to the selected year are displayed, and vice-versa.